“Though it breezes through many touchy issues, Green Book exudes an quixotic Forrest Gump sort of appeal that is all pervading,” writes Biswarup Sarangi. Award season favourite Green Book is an easy film to fall in love with. Named after a cautionary guide book for road bound coloured people and punctuated with cliches (blacks slaving in cotton fields, tough cops who refuse to yield) left, right and centre, the film still goes where few big studio productions have been to in recent times. And like its consummate protagonist enthralling a reservations only jazz club on a Friday night, it hits all the right notes after the characters have warmed up. 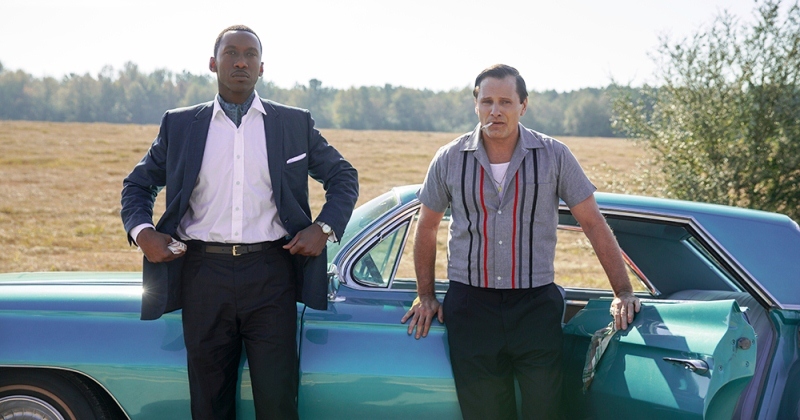 Mahershala Ali (ebony) and Viggo Mortensen (ivory) shine as a piano virtuoso and his newly hired driver/bodyguard on tour through the consistently unpredictable and yet intriguingly charming southern states of the 60s era. Ali slips into the role of a man with refined sensibilities like a fish takes to water. Viggo Mortensen, though, does a more admirable turn as an Italian bouncer who’s ‘all hands.’ In the way that a lot of Italians are all hands. He dyes his hair black, puts on twenty five kilos and spouts an Italian accent that is a perfect foil to Ali’s gentle demeanour. Notwithstanding the bawdy reputation of director Peter Farrelly (There’s something about Mary, Dumb & Dumber), these two men manage to bestow Green Book with a Swiss knife sort of multi-pronged, utilitarian appeal that would make it indispensable when the road map for 2018 is pulled out a year or two later. By multi-pronged, I mean the film works as a road film, an ode to genuine, incidental friendship between total strangers with nothing in common, social commentary on race, gender and culture relations in 1960’s America and also as a consistently underplayed but wonderfully warm comedy that culminates in coming home for Christmas. Just about reaching in time, in fact, despite its two hours plus running time. Though it breezes through many touchy issues, Green Book exudes an quixotic Forrest Gump sort of appeal that is all pervading. A quasi biographical drama set back in time and pitching a black man against a white, a musician against a knuckle-head, a constant clash of cultures that both protagonists eventually emerge richer from. No punches are pulled in getting down and real on the cultural landscape; the anecdotal screenplay ensures its peppered with all-American icons like KFC, Aretha Franklin and of course, jazz piano. The Green Book of 2018 may not be as indispensable as 40 years ago, but it’s almost as relevant and sincere. Biswarup Sarangi is an architect based in Bengaluru.